"Youn's Kitchen," a popular reality show on cable channel tvN, returns this week with its signature formula for success -- celebrities basking in slow living at an exotic, picture-perfect location. 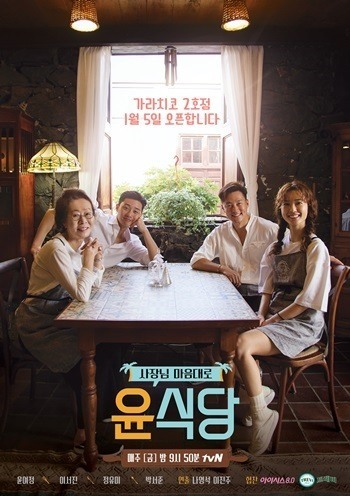 The new series will air Friday and feature four famous actors running a temporary mom and pop Korean restaurant in the small town of Garachico on Tenerife, the largest of Spain's Canary Islands. Season 2 will maintain the original cast of Youn Yuh-jung, Jung Yu-mi and Lee Seo-jin, with senior actor Shin Goo replaced by young heartthrob Park Seo-joon. Producer Na Young-seok said during an online talk show that the series was shot in a small, sleepy Spanish town where cast members were able to "build relationships with local residents." In the first season, the quartet sold Korean food, including "bulgogi," or marinated beef, at a small seaside restaurant in Gili Trawangan, northwest of Indonesia's Lombok. "Unlike the first season's restaurant, where we had travelers from all over the world, it was less crowded this time since most visitors were locals," he said. The segment was livestreamed Thursday afternoon on the V Live platform of South Korea's biggest portal site, Naver, to mark the start of the second season. Another big difference is the main menu. "We were looking for a Korean food that is familiar to us but interesting or popular with foreigners," scriptwriter Kim Dae-ju said of the rationale for choosing "bibimbap," Korean rice topped with an assortment of vegetables and meats. The nine-episode first season aired from March 24 to May 19, 2017. The show helped spread a social trend among young Koreans of trying to break away from a lifestyle devoted to work and money and embracing the motto YOLO, which means "You Only Live Once." The show's ratings peaked at 14.1 percent, considerably high for a cable channel program, according to Nielsen Korea. Actor Lee Seo-jin said he was already thinking about Season 3. "If ratings hit 15 percent or higher, we will produce a third season. So please watch the second season if you want us to make the next one," he said. He joked that he's already designed staff uniforms for the third season.